Sebastian Vettel secured victory at the Bahrain Grand Prix, having controlled the race from the start. Valtteri Bottas came close, but failed to make it past the Ferrari. 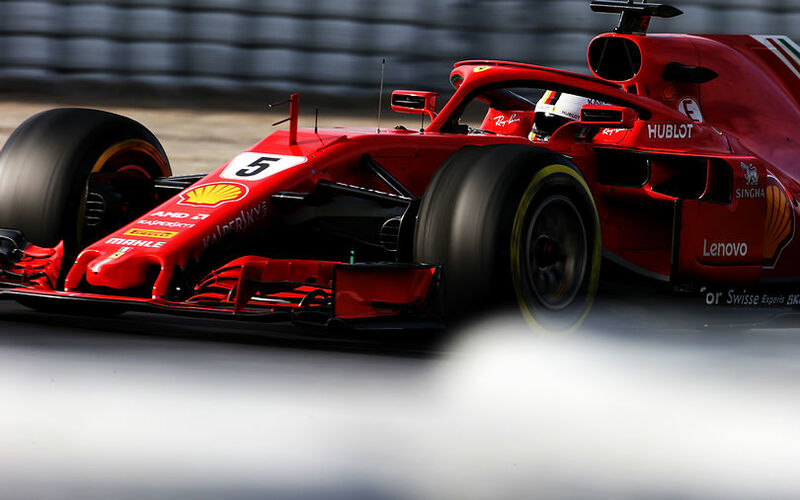 Lewis Hamilton finished third while the minds of Ferrari were surely with the mechanic that got injured in a failed pitstop for Kimi Raikkonen. The Bahrain Grand Prix was set to be an interesting showing, with a 5-place grid penalty forcing Hamilton to start from 9th. Max Verstappen started from 15th after a crash during Q1. Both McLarens, in 13th and 14th, were both adamant their race pace should be a lot better than in qualifying. And at the back, it was crucial for Williams to find some better performance after ending up being the only team that was slower than last year. When the lights went out, Vettel easily retained the lead. Raikkonen had a difficult start and saw Bottas immediately move ahead into second. Raikkonen held third, followed up by Gasly. The latter was repassed through Turn 4 by Ricciardo. Further back, Alonso moved up into 9th after a very strong start, passing Hamilton after Turn 5. The Brit appeared to be very cautious, and rapidly saw Verstappen challenging his position. In his usual fashion, the Dutchman didn't wait long to make a real move, and passed Hamilton at Turn 1 of the second lap. However, as he exited the turn wide, with Hamilton still there, the two cars touched, creating a puncture for Verstappen who slowly returned to the pits, rejoining the race 50s down on Leclerc, who was 19th. More bad luck struck for Red Bull as Daniel Ricciardo came to a halt on lap 2. It wasn't really the end yet, as 3 laps later, Verstappen was to abandon as well. A short VSC period was instated during Ricciardo's stoppage, and as soon as the race was back on, Hamilton gained three positions at once, enjoying the slipstream from Alonso to also pass Hulkenberg and Ocon at the same time. Alonso later passed Ocon as well to stay 8th, while Hamilton went on to take 5th by getting ahead of Magnussen's Haas as well. On lap 8, Hamilton progressed into 4th by taking Gasly while Magnussen started to lead a train behind him, including Hulkenberg, Alonso with Ocon and Hartley another 1.3s further down. By lap 12, the race had become completely stale, with Vettel leading by 3s over Bottas. Raikkonen was another additional 3s further down while Hamilton ran 8s behind the Finnish Ferrari and 9s ahead of Gasly. Time for some pitstops then, with Alonso being the first to change to mediums. Most others opted to switch from supersoft to soft, or the other way around, depending on what they started on. Vettel pitted on lap 19, changing tyres at a time when performance was clearly degrading. Raikkonen pitted the next lap. Valtteri Bottas pitted another lap later, changing to medium tyres, contrary to Ferrari who chose softs for their second stints. On lap 25, Ericsson pitted to change to mediums, leaving Hamilton the only man to not have stopped yet. While leading the race, Hamilton did get company of Vettel. It resulted in some amusing moments where Hamilton didn't want or need to let Vettel pass by easily, but when they arrived at the main straight, the DRS was obviously too powerful for Hamilton to do anything. At the end of that lap, Hamilton predictably changed to mediums in an attempt to make it to the finish with just one stop. The Brit returned to the track in 4th position, 18 seconds down on Raikkonen. By lap 34, Hamilton's deficit had reduced to 14s, triggering him to query about who would emerge ahead if the Ferrari's would stop under a safety car at that moment. One lap later, Ferrari pit Raikkonen, which would end up in distaster. When the Fin got green to go, he pushed the throttle and ran over a mechanic's leg that as still in front of the left rear tyre. The mechanics were in all states, and Raikkonen was furious as well, stopping 20m later, stepping out of the car and throwing the steering wheel into the cockpit. The mechanic received medical attention in the pitlane and Ferrari reported 10 minutes later he was being brought to hospital. Ferrari team principal, Maurizio Arrivabene, stepped into the pitbox to calm everybody down, as most mechanics seemed angry with the situation. Vettel was meanwhile told "Plan B, Kimi retired with an issue". That again triggered a lot of communication between Hamilton and his team, as the Mercedes driver seemed anxious to know the best way to make up positions in the final 15 laps of the race. On lap 44 of 57, Vettel still led, 7s ahead of Bottas and another 9 to Hamilton. Gasly steadily continued after he inherited 4th, but the Toro Rosso driver was already 52s down on the leading trio. Due to the differing pitstop strategies, a lot of overtakes were to be seen across the field. Hamilton had to carve his was through the field, Sainz moved up into the points after having driven out of them for most of the race. 5 laps from the end, Bottas ended up closing in on Vettel, making use of the better durability of the medium tyre to reel the Ferrari in. As they crossed the finish line with 5 laps remaining, the gap was 2.9s. 3 laps later, with just 2 left, the gap was down to 0.995 seconds. At the start of the final lap, Bottas was in striking distance, but just a little too far to outbrake Vettel into turn 1. The leading German however did give the victory away , eeking what was left in the soft tyres to secure the race which he controlled as of the start. Lewis Hamilton ended just 6 seconds down on the leader, followed by Gasly who secures an impressive 4th position for Toro Rosso Honda at only their second race together.